Thread: [OT] Tweeting for Joel! Throughout our uni years we developed so many in-jokes we almost had our own language. 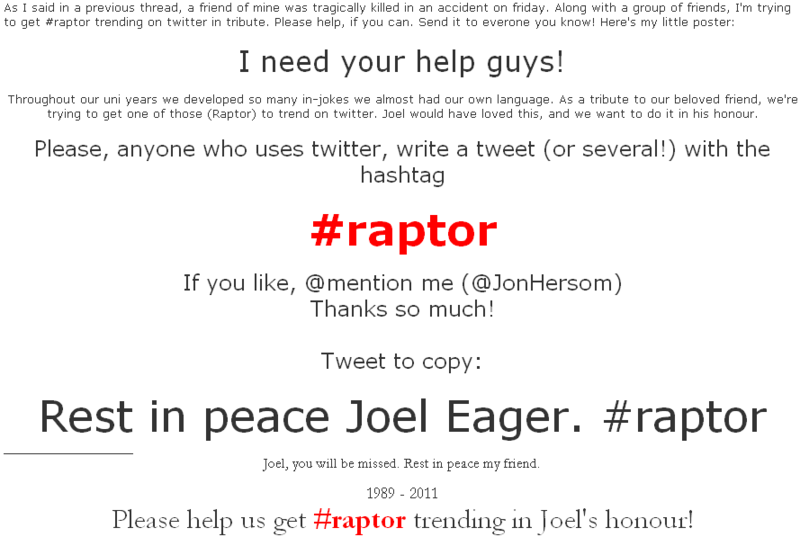 As a tribute to our beloved friend, we're trying to get one of those (Raptor) to trend on twitter. Joel would have loved this, and we want to do it in his honour. took a screen cap and posted it around a bit. here it is if anyone wants to use it. Thanks so much man! Skrillex just retweeted me, as did Shiftee a little while ago. Let's get this trending! Track the progress: go to hashtags.org and enter 'raptor'. Last edited by fullenglishpint; 07-06-2011 at 06:23 PM. "Hey bro, you got any Skrillex? How about Deadmaufive?" "Dream if you live forever, live if you will die today"